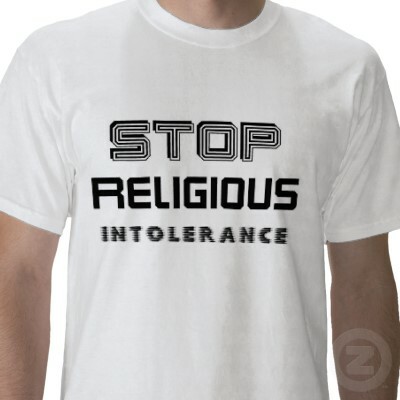 Do the Irreligious Realize They Are Intolerant? One more link before I get to Church and get working. Rod Dreher, at RealClear Religion has a post up on the growing intolerance of the tolerant obsessed left/progressive wing. Last Saturday, a friend who works at our neighborhood farmer’s market complimented one of her fellow vendors on her dress. In case you didn’t know, the owners of the fashion chain are Korean Christians who print “John 3:16” on their shopping bags. Gibbering maniacs, obviously. Recalling the story, my friend, who is a practicing Christian, said she was so shocked that she didn’t know how to respond. Had I been in my friend’s place, I probably would have reacted the same way, too startled by the revelation that my market colleague was probably a bigot to have mustered much of a response. But this is not the first time that’s happened at our farmer’s market. One of the best and friendliest customers of my friend’s farm stand cut loose one day with a mini-tirade against pro-lifers and Christians. It had never occurred to this woman that she was buying goods from two pro-life Christian women. She simply assumed that they must agree with her, because everybody knows that only liberals live in our neighborhood and frequent farmers’ markets. True, our neighborhood is overwhelmingly liberal, at least to judge by voting patterns and the frequency of left-wing bumper stickers on cars lining the streets. It’s the kind of place where you don’t expect conservative Christians to live. But we do — and some of us (I’m thinking of some of my Catholic friends) are even Democrats. Continue reading……. This entry was posted in Christianity, Church and the Public Square and tagged Atheism, Religious intolerance. Bookmark the permalink. 2 Responses to Do the Irreligious Realize They Are Intolerant? Great post. Thanks for sharing it! First, there’s a difference between being insulting and intolerant. The woman in the story is clearly being insulting, but for her to be intolerant she would need to be refusing to shop somewhere because of the owners’ religion. Or even worse than that, trying to get them to close because of it. This woman was doing neither of those things. In fact, she was giving them their business despite the fact that she felt the need to insult them. So, she’s definitely rude. But not really intolerant, at least as far as I understand the term. And I could be wrong, of course. Secondly, she used the descriptive word ‘crazy’ before the word ‘Christian’. Clearly, an insult. But also possibly a way of delineating the difference, at least in this woman’s mind, between just Christians and ‘crazy’ Christians.